Nina Ricci has launched Les Sorbets, new limited edition, gelato-inspired flankers to 2018's Bella, 2016's Luna and 2006's Nina. Les Sorbets de Bella (green) ~ "Let yourself be bewitched by the vivacity of a frozen fruit nectar : the green mandarin, the grapefruit, the rhubarb and the pomegranate form an iced cocktail producing a tingle of rose jelly, along with a few crumpled leaves of shiso and violet." Additional notes include woods. Les Sorbets de Luna (blue) ~ "Imagine the union of fresh fruits and a bouquet of slightly frozen flowers. That is Les Sorbets de Luna, a fragrance with an incredible charm in which bergamot and Nashi pear mingle with a floral trio (jasmine, magnolia and peony) as dew-beads. A delicious sensational elixir." Additional notes include cassis, rhubarb, cedar and musk. Les Sorbets de Nina (pink) ~ "An essence successfully bringing together the sweetness of caramel notes with the spontaneity of an acidic harmony, in which the lemon, the clementine and the raspberry blend. This Eau de Toilette is a real delight to be savoured, nice and fresh." Additional notes include gardenia and jasmine. 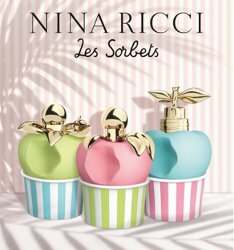 Nina Ricci Les Sorbets are available in 50 ml Eau de Toilette. I understand that I am not the target audience for these things but they sound horrible and those bottles are making my eyes twitch: they’re in the wrong cups, that “bite” is just creepy, and the only one that doesn’t look as if it’s being attacked by an octopus is the blue one, which will clearly stab you in the hand if you’re not careful. Maybe I’m just in a mood but holy cow do those ever seem wrong in every possible way.